Where do Jellyfish live? why? Jellyfish are found all over the world from surface waters to deep sea waters. Some species live in the cold arctic water and others live in the warm tropical waters they swim in a group because it keeps them together through currents. What do Jellyfish eat? how? 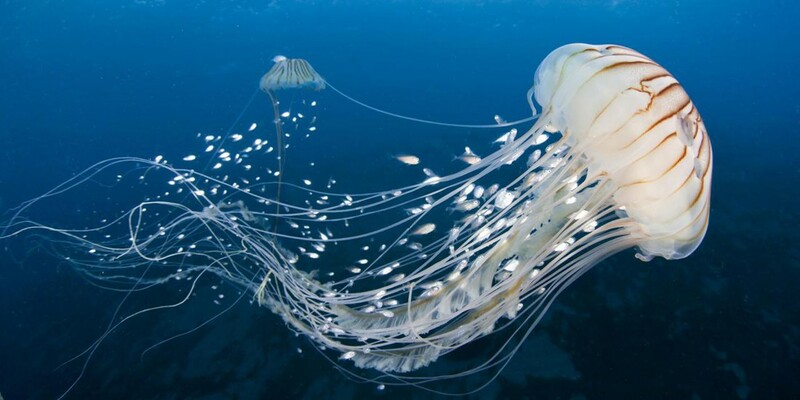 Jellyfish eat many different types of things such as small plants, copepods (crustacean zooplankton) (phytoplankton) fish eggs and small fish called larvae, they also eat planktonic eggs and young stages also called larvae. Body parts: mouth, eye spots, bell, oral tentacles, gonads, bell margin.